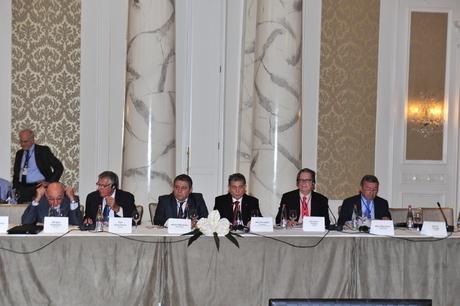 Prospects for use of green energy were discussed at the "The convergence of technologies and the shape of the future: the main challenges of the 21st century" seminar in the framework of the third Baku International Humanitarian Forum on November 1. The forum was opened in the Azerbaijani capital at the Heydar Aliyev Center on October 31. The seminar involves eminent scientists from around the world, including several Nobel Prize winners in physics and chemistry, who discussing quantum computing, substance study and other issues. President of the Azerbaijan National Academy of Sciences Akif Alizadeh,who adressed the event, said that a declaration may be adopted following the seminar. A roundtable on "Scientific innovations and their transfer into the educational environment" was also held as part of the forum. The meeting, organized by the Baku State University, was attended by scientists, including Nobel laureates, scientists, teachers, and business people from 28 countries. Baku International Humanitarian Forum is a high-profile global scientific and political platform for tackling the challenges facing humanity in the 21st century, holding dialogue, discussions and exchange of views on a wide range of issues of humanitarian cooperation. It is an annual event that brings together outstanding representatives of political, scientific and cultural elite of the world, including well-known statesmen, Nobel Prize winners in various fields of science and heads of influential international organizations. Representatives of natural, social sciences and humanities, as well as the cultural elite of the world who have set the ambitious task of forming a new humanitarian agenda with a view to further considering it on the worldwide scale are the organizers and participants of the forum. With its rich traditions of cooperation among different cultures, civilizations and religions, Azerbaijan is the ideal venue for holding such events. AzerTac: Armenia hides occupation of Azerbaijani lands under guise of "struggle for freedom"